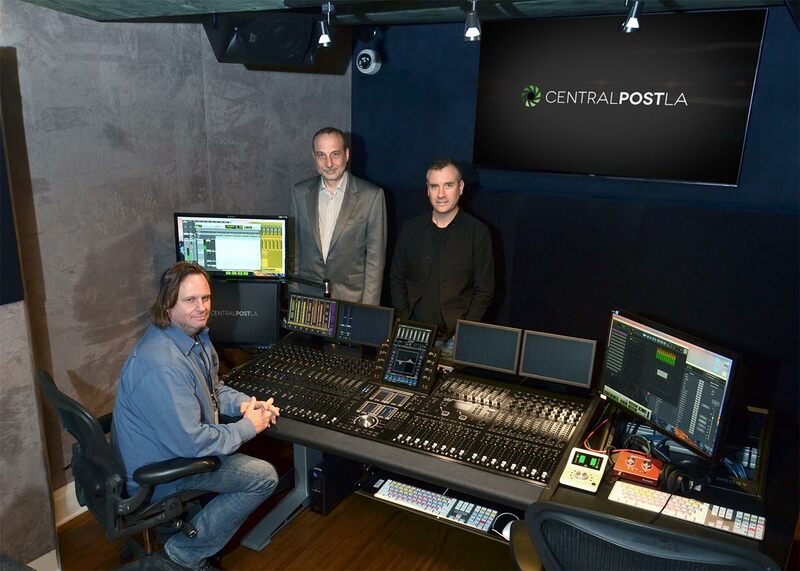 A full service post production facility specializing in localization and ADR. 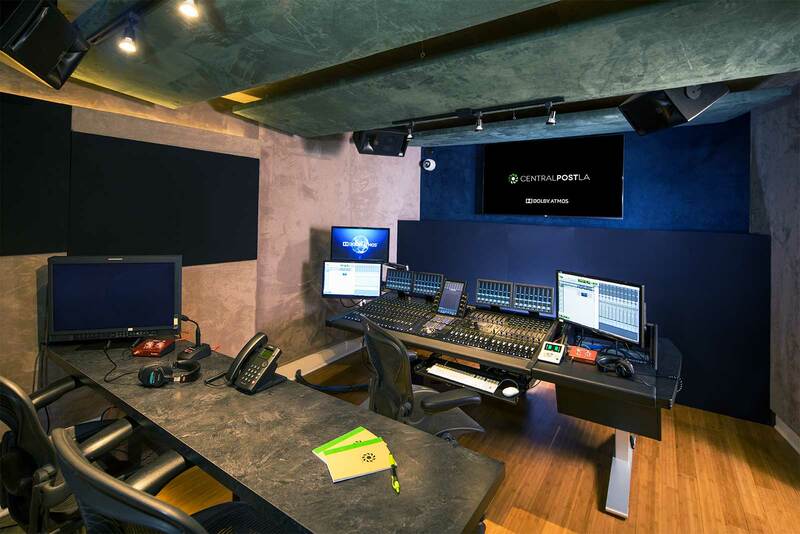 Full CDSA certified and one of the only facilities in Los Angeles to offer Dolby Atmos-At-Home mixing. Audio Mix: Dolby 5.1, 7.1 and Small Format Atmos. Color/Picture Grading, and Edit. ADR. Blu-Ray and UHD Authoring. Point to Point Secure Large File Transfers. All Delivery Formats. Project Scope: Installation of the four control rooms, three recording spaces, and the machine room. Three of the control rooms are paired with voice recording rooms. One is a radio style, one-person booth. One of them can accommodate three or four people comfortably. The other can accommodate five to six people comfortably. Integration: Jim Pace and the AID team worked closely with Central Post LA, beginning with a search for the proper location in 2016 through the completion of the entire operation in 2017. A Conversation with Reid Caulfield and Chris Davies of Central Post and Jim Pace of Audio Intervisual Design, conducted by David Goggin. Pictured (L-R) are VP of Operations/ Re-recording Mixer Reid Caulfield, AID President Jim Pace, and Managing Partner Chris Davies. Photo by David Goggin. David: How many rooms do you have here at Central Post LA? Reid: We have a total of seven rooms. 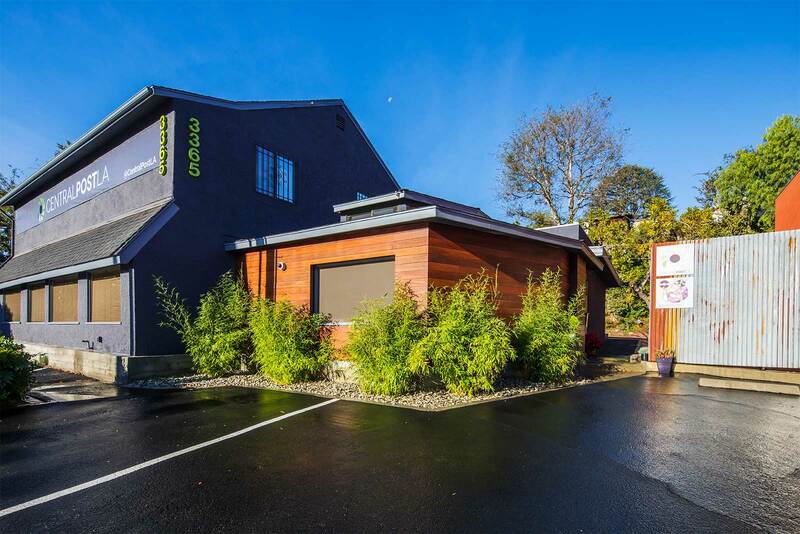 There are four control rooms; three are paired with voice recording spaces, and we have one dedicated mix room, which is fully-certified for Dolby Atmos at home, a mix room that is not paired with a specific recording space, but obviously, we can tie through and interface from any room to any other room. David: And how do you tie them all together? Reid: We’re running Audio over IP (AoIP) for this facility, using Dante as our protocol, and tying one room to another is simply a matter of cross-patching a network in the machine room. David: After purchasing the building and gutting it, you’ve been in business now since April, 2017. You first bought the building and gutted it and now everything’s new. And when did Jim Pace at AID jump into the picture? Reid: Right from the start in October of 2016. I first got in touch with Jim, and told him what I was thinking about doing and asked if AID be interested in helping us. This is even before my business partner Chris Davies and I knew each other. I had clients who had been saying for years that I should do my own thing and if I had my own space they would they would bring their work to me. I kept putting it off and putting it off, but eventually I went looking for a business partner, which I found in Chris Davies. But the very, very first thing I did, even before Chris and I got in touch with each other, was I went to Jim to talk to him about what he thought about the liability of doing it. Because I’ve done this before and I’ve had my own facility before. It was in Santa Monica in the early 2000s, but by 2005 I got out of the business, because it was just changing too much and I swore I would never do another facility again. David: So Jim, when these gentlemen came to you with this project, what was your overview of everything at that point? Jim: I’d known Reid for quite a number of years, knew his skillset, and the type of client base he worked with. We had worked with him on another project in Marina del Rey that was very successful, prior to this project. And then the question was could a suitable space be found that would compliment the requirements? And obviously, real estate in Los Angeles has a very peculiar set of circumstances for this sort of application. Basically, their concept at that point was to find a space that would work, one that would offer the most efficient use of multi-room space, because you can’t do a single room facility anymore. They narrowed the search down after looking at many locations. It took several months of research and looking around, and doing space planning and concepts and working with the guys on what the model would be, and how to most efficiently use each space. The key to success now is versatility and being able to provide whatever services the customer wants, but you start with the real estate. David: And why did this space win the contest? Chris: This space became available and it previously was a post-production facility, so there were certain advantages when stepping in here, plus the location is pretty central, no pun intended. Very close to Warner’s, very close to Universal, very close to Disney, Dreamworks, Hollywood, take your pick. So it was a good location, and it fit the bill for what we would need it to do in terms of getting off the ground. And when you tell people we are right next door to the old Dolby building, they know instantly where it is. Reid: The research for the right space took place between November of 2016 and April of 2017. Many times Chris would call me and I would call Jim and we’d all traipse out to see a new location. By March, that was getting long in the tooth, it was getting tiresome. We had found a couple of places, and we’d been talking about leasing space. But we found a lot of resistance from building owners, for a number of reasons. We are a new company and some of them didn’t want a recording studio post facility and they didn’t want new walls going up. Chris found this place and it was perfect, and because it had been a video facility the technical infrastructure was already mostly there. We did gut it, but you know, there were still ceiling trusses that had cables strung along them, so there was a lot of work we didn’t need to do. The gutting was about reformatting the rooms from being small offices, where they edited video, and a couple of dedicated video finishing rooms, into something that was architecturally sound to do what we needed to do. And so, for that phase, we got in touch with Jim and asked him to suggest designers. Jim: The idea was that every client has certain requirements and in Los Angeles there are many design opportunities and resources. For the few areas we don’t handle in house, we only work with people with whom we feel confident, and will provide the proper service and treatment of our client. That’s not negotiable. In this particular case, the set of people we introduced pretty much stayed with the project all the way through. We spent a fair amount of our time managing those people and we helped make that transition smooth from owner to contractor and subcontractors. There’s a bridge that’s required there because there are two different languages that are spoken. We need to make sure that the intent is carried out, expectations are set correctly, and then we need to monitor throughout the projects to make sure they stay on track. No one can afford mistakes. David: What is there about this space that has really worked out best for you? Chris: Well, I’d say there are several things. I like to think in terms of putting us ahead of the game, because I think we can handle numerous things that older facilities cannot. As Jim said earlier, it’s a multi-room facility and we can offer more to the client that way. Plus, because it was a video place, we can offer some additional packages, so we’re doing audio and video and that’s convenient for some of our clients. When it all materialized, there was a nexus we were looking for in terms of being able to do projects in Dolby Atmos Mixing and the post-production specialties that folks are looking for these days. Reid: Everyone knows that the facilities business goes up and down. When I got out in 2005 and said I wouldn’t do that again, we just didn’t know where everything was going to lead us ten or twelve years later. And now there’s a Renaissance going on again in Los Angeles because of the abundance of work that’s happening. Because we were lucky enough to be building from the ground up, we got to experiment, talk to Jim and his people about what we could actually do with Dante protocol in this facility. We could afford to do this and that and we decided that there were things that we didn’t have to do, so we could afford to do other things. For instance, we could afford to put an Avid S6 console in because we didn’t have to shore up the old video infrastructure. Every five to eight years, there seems to be something that comes along that requires reinvestment in a facility, a recommitment to the future. And a lot of people drop out. We’ve seen many mergers and acquisitions happen over the last eight years. Larger companies swallowing smaller companies. But the real story is that those smaller companies, those smaller post facilities, got out for a reason when they got out. Reid: It’s important to note that right now we’re going through a cycle of content hacking, and content theft. Central Post is a fully secured facility. We’ve just been given the green light by the CDSA, the people who now at the top of the chain in terms of content security. Its physical security, so there are cameras. And there are alarm systems, obviously. It’s IT security, so our machine room in the back is a fully IT secure environment that I don’t even have all the keys to. One of our partners is a dedicated IT person, and a very pedigreed IT operator. Way above what we needed, but it turned out that we needed an awful lot. But the security issue, the money that’s required, the things that happened a year ago at other facilities in town with content being stolen, that’s not inexpensive. And if you are piling all of that on to an existing legacy facility, is expensive and also very unwieldy. IT people have to come in and they don’t care about the creative flow and work stoppage. So, we were able to organically build all of that up from the beginning. Yes, it cost a lot of money. But probably nowhere near what it would have cost if we had been here for fifteen years and needed to pile it all on top. And we also have some legacy video technology, such as HD cams and SR machines. It’s amazing to me, when I go out to new facilities around town built in the last five years, that there’s no legacy technology. It’s all file-based and of course that’s where we’re all going, and that’s fantastic. But we have broadcast clients that still demand that we have tape. So, we were lucky finding this building and being able to buy all of the equipment that was here. Once we had that finalized and integrated some legacy technology, then we started to go wider. The place was originally designed for foreign language localization, and ADR recording and mixing. Now with a full rack of legacy video machines, I can go to clients and say we’re able to accommodate this type of work, and then it builds out from there. So, the big issue is that every five to eight years, something drives facilities out; they just don’t want to be bothered. And we’re hitting this crest, maybe five, ten years from now, something happens and we might just say, oh that’s just a bridge too far. And that’s all good. And I have friends who own facilities in town now who are going through those discussions. Reid: Well, we first built four control rooms. Three of them are paired with voice recording rooms. One is a radio style, one-person booth. One of them can accommodate three or four people comfortably. The other can accommodate five to six people comfortably. So, we wanted a mix of sizes. They all translate really well, so I could put someone in our A room, and then continue the project in a different voice record room. And everything sounds identical, so there’s not a lot of matching work to be done. The control rooms were important because we’ve got a significantly smaller one that was originally designed as a headphone QC room. But now it’s paired with our largest recording space. We wanted two primary mix rooms. The Atmos at Home mix room with the Dolby Avid S6 is our primary space. The next space is what we call our ambient room, and that has a five-year old Avid twenty-four fader D Command console. Then we have a third mix room, which is primarily a voice recording room. But, I’ve used all three of them as mix rooms. And then the fourth room, our smallest control room, its not a mix room at all. It’s a QC prep room. We decided to build the Atmos at Home room, because our original concept had been to havd a 7.1 room. They are small rooms, and it was Jim who said two of these rooms might be sizable enough for an ATMOS at Home. And we looked at it, and as we were going to be doing a 7.1 room anyway, so it wasn’t that much of a leap. And then various things started to happen. We have a broadcast client who has been doing primary mixing in full theatrical ATMOS for television for years. He said that even QC requires an ATMOS room and if we were going to do that it would be something he would love to talk with us about. Once we started talking to people about it, it was clear that that jump while expensive, was not crazily expensive, and it was something that we wanted to do. And once we started talking about that, we started talking about the Avid S6, which is a 32-fader, five-bucket frame console that can handle some pretty significant work. Reid: Having been chosen with the idea of foreign language dubbing, the way it works is very simple. For any single episode of television, or a feature, it’s basically three to four days of recording. And a one-day mix, which is essentially a dialog pre-dub. And we have one day to mix dozens of channels, sometimes up to a 120 channels. With dozens or hundreds of voices, we’ll have thirty actors come through in a single day, multiplied by three or four days. We’re taking in files from various places around the world, with people recording in whatever they have in their studios in their hometowns. And it all has to be put together and mixed like a feature in one day. Jim very early on said we might consider an eight channel S6 and having done these for years, we decided to spread out a bit, so we came to the idea of the thirty-two channel console. Our second mix room, our B mix room, has a twenty-four channel D command and that’s fine for 7.1. The Atmos situation just threw everything else under the bus; there was no way we were going to be able to do that without putting an S6 in. I used to work at a place that had an ATMOS at Home room with a D command and I’m not sure what tricks they had to do to pull it off, but it gets very complicated. We wanted something that engineers could step into, pull up a template, and go and mix, or record, or do whatever they were going to do. All monitoring here is JBL. It seems to be the Rosetta stone of monitoring situations. We wanted to be able to translate and when I visited other facilities, everything was pretty much standardized. It works well, because it’s not too eccentric and it’s not down at the bottom end, so we’re very happy with the JBL choice. Chris: To sum it up, we’ve had a fabulous experience with Jim and his team at AID. We’re really very happy with the work. And we were impressed at how it all came together in just a six-month period, to secure certification and being up and running and all that entails. Reid: I’ve been working with Jim and AID since 1992, when I first came to Los Angeles. Before that, back in Montreal, I’d been reading about AID and so, when I got to Los Angeles I needed to build facilities and we called Jim. In 26 years, I ‘ve only done one room without Jim and that didn’t work out at all. Like Jim said, no one’s got the time and the money to mess around with one vendor and then have to switch in mid stream. We just went to AID directly, and they worked with us from beginning to end.